In this application protocol, we describe how to isolate untouched human tumor cells in an easy workflow that improves sensitivity and reduces bias in downstream applications, such as next-generation sequencing and tumor cell culture. Solid tumors are dissociated into viable single-cell suspensions and untouched tumor cells are then isolated using MACS® technology. (Optional) Fluorochrome-conjugated antibodies for flow cytometry analysis, e.g., CD326 (EpCAM)-VioBlue®. and CD31-PE. Learn more about our antibodies and dyes. Create a viable single-cell suspension from a solid human tumor using the gentleMACS™ Octo Dissociator with Heaters in combination with the Tumor Dissociation Kit, human. Follow the protocol from the kit data sheet. Isolate untouched human tumor cells using the Tumor Cell Isolation Kit, human and LS Columns. Follow the protocol of the kit data sheet. General workflow for the rapid isolation of untouched tumor cells. The procedure is based on the comprehensive depletion of cells of non-tumor origin by combining automated tissue dissociation and magnetic cell isolation. A negative selection strategy enables the isolation of the tumor cell population without specific knowledge of surface marker expression on these cells. Flow cytometry analysis of isolated human tumor cells. A comparison of bulk tumor tissue and isolated tumor cells shows elimination of over 95% of the contaminating cells with this protocol, which takes less than 20 minutes. Flow cytometry analysis of isolated human tumor cells. A comparison of bulk tumor tissue and isolated tumor cells shows elimination of over 95% of the contaminating cells with this protocol, which takes less than 20 minutes. Cultures of isolated tumor cells were nearly pure after seven days. Upon magnetic separation, the original bulk (left) and isolated tumor cell (right) fractions were cultured for three to seven days, fixed, and stained. Cells were stained for the human-specific epithelial tumor marker CD326 (EpCAM) and vimentin (human tumor cells were negative for vimentin) to unambiguously identify fibroblasts. Even after seven days, the cultures of isolated tumor cells were nearly pure. Cultures of isolated human tumor cells were nearly pure after seven days. Upon magnetic separation, the original bulk and isolated tumor cell fractions were cultured for three to seven days, fixed, and stained. Human tumors were stained for the human-specific epithelial tumor marker CD326 (EpCAM) and vimentin (human tumor cells were negative for vimentin) to unambiguously identify fibroblasts. Even after seven days, the cultures of isolated tumor cells were nearly pure. Accurate detection of loss of heterozygosity events in isolated tumor cells. DNA from bulk tumor or isolated tumor cells was used to produce exome-captured sequencing libraries applying the Nextera® Rapid Capture Exome Kit (Illumina®). For sequencing on a MiSeq® instrument (Illumina) the MiSeq Reagent Kit v3 (150 cycle, Illumina) was utilized to generate 75-bp paired-end reads. After adapter clipping (trimmomatic v0.33), the reads were mapped against the human genome (bwa v0.7.12). Duplicate reads were removed (MarkDuplicates, Picard Tools v1.134), and SNP calling was conducted using VarScan v2.4.0 restricted to the regions targeted by the Nextera Rapid Capture Exome Kit. Finally, snpEff/snpSift v4.2 was applied for SNP effect prediction and SNP annotation. As no healthy control tissue was available for comparison, a SNP was defined as a difference between the sequenced sample and the reference genome (hg19). An important task in the context of tumor analysis is the detection of LOH (loss of heterozygosity). For that purpose, the number of SNPs with variant frequencies ≥0.95 or ≤0.05 were compared between bulk tumor and isolated tumor cells. 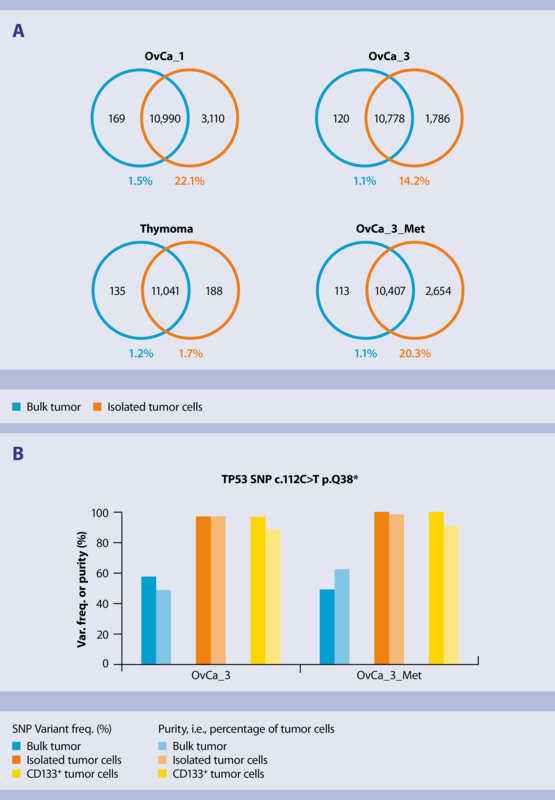 In three out of four tumor specimens (OvCa_1, OvCa_3, OvCa_3_Met), a much higher number of SNPs fulfilling this selection criterion was detected in the isolated tumor cells compared to bulk tumor (A) indicating an improved detectability of LOH after tumor cell isolation. Figure B exemplifies this finding in tumor sample OvCa_3 for a deleterious SNP (ENST00000413465:c.112C>T p.Q38, COSM236889, not in dbSNP) causing a stop gain within a subset of transcript variants of the TP53 gene. While a variant frequency in the bulk tumor of 57% suggested a heterozygous SNP, an LOH event was indicated in the isolated tumor cells (97%) and the CD133+ cells (96%). Accurate detection of loss of heterozygosity events in isolated tumor cells. DNA from bulk tumor or isolated tumor cells was used to produce exome-captured sequencing libraries applying the Nextera Rapid Capture Exome Kit (Illumina). For sequencing on a MiSeq instrument (Illumina) the MiSeq Reagent Kit v3 (150 cycle, Illumina) was utilized to generate 75-bp paired-end reads. After adapter clipping (trimmomatic v0.33), the reads were mapped against the human genome (bwa v0.7.12). Duplicate reads were removed (MarkDuplicates, Picard Tools v1.134), and SNP calling was conducted using VarScan v2.4.0 restricted to the regions targeted by the Nextera Rapid Capture Exome Kit. Finally, snpEff/snpSift v4.2 was applied for SNP effect prediction and SNP annotation. As no healthy control tissue was available for comparison, a SNP was defined as a difference between the sequenced sample and the reference genome (hg19). An important task in the context of tumor analysis is the detection of LOH (loss of heterozygosity). For that purpose, the number of SNPs with variant frequencies ≥0.95 or ≤0.05 were compared between bulk tumor and isolated tumor cells. In three out of four tumor specimens (OvCa_1, OvCa_3, OvCa_3_Met), a much higher number of SNPs fulfilling this selection criterion was detected in the isolated tumor cells compared to bulk tumor (A) indicating an improved detectability of LOH after tumor cell isolation. Figure B exemplifies this finding in tumor sample OvCa_3 for a deleterious SNP (ENST00000413465:c.112C>T p.Q38, COSM236889, not in dbSNP) causing a stop gain within a subset of transcript variants of the TP53 gene. While a variant frequency in the bulk tumor of 57% suggested a heterozygous SNP, an LOH event was indicated in the isolated tumor cells (97%) and the CD133+ cells (96%).